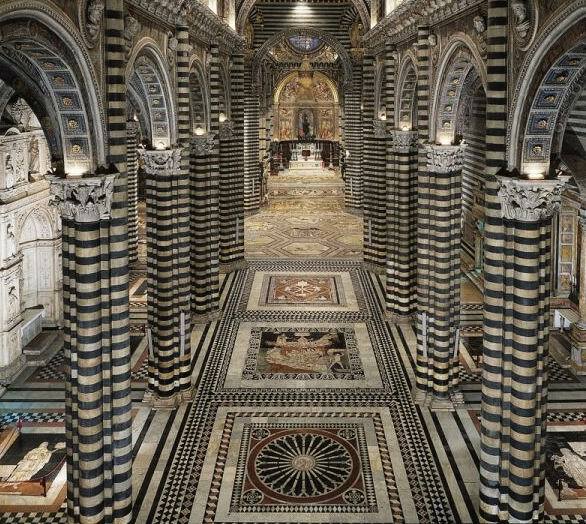 Every year the Cathedral of Siena unveils its magnificent inlaid marble mosaic floor for a short period. Generally to preserve these treasures the floor is covered and only a few are on display. This year, a Jubilee year, it was already exceptionally uncovered in July, now, as by tradition, it will occur from August 18 to October 26. 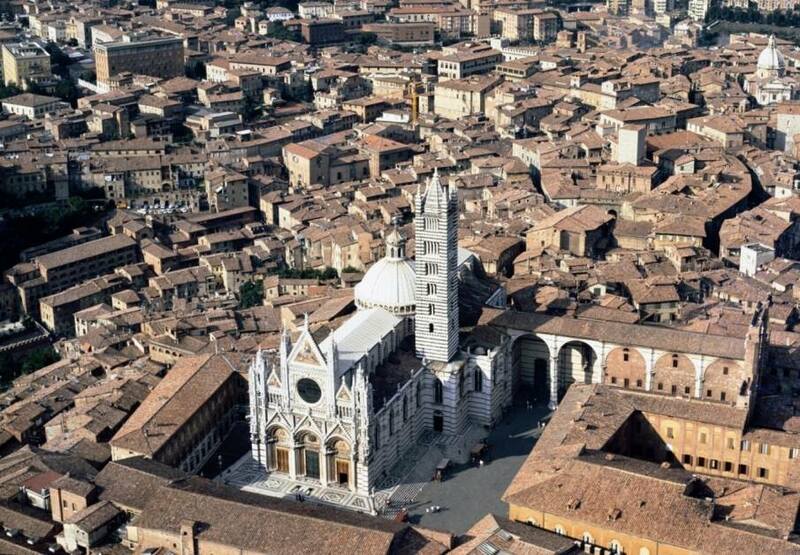 Siena’s Romanesque-Gothic Duomo is without doubt the hub of this wonderful city, attracting over one million visitors every year. Yet not to be forgotten are also the Crypt, the Baptistery and the Opera Museum, this entire complex contains some of the most important monuments of the European artistic panorama. 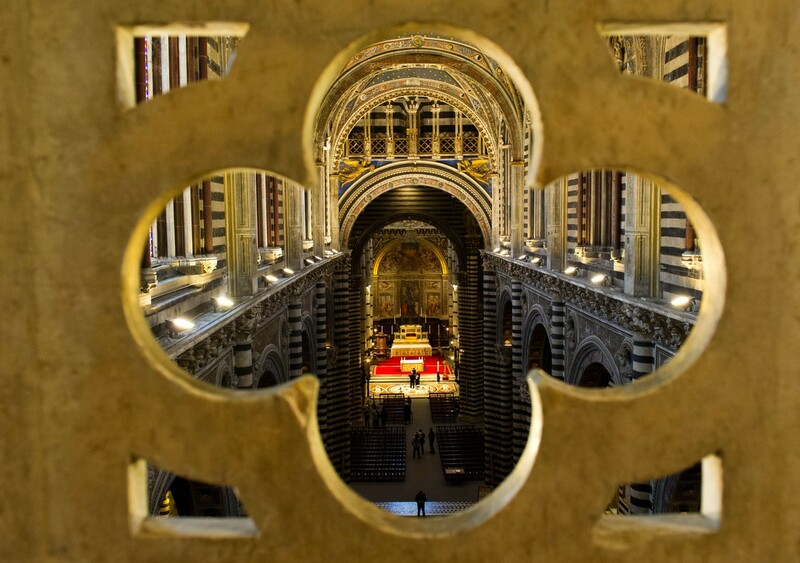 Of the numerous works of art enclosed in the Cathedral of Siena, one of the most exceptional is certainly its floor. The works on this inlaid marble mosaic masterpiece were carried on from the 14th to the 16th centuries and saw the contribution of about 40 important artists, all from Siena except for the Umbrian painter Bernardino di Betto, better known as Pinturicchio. 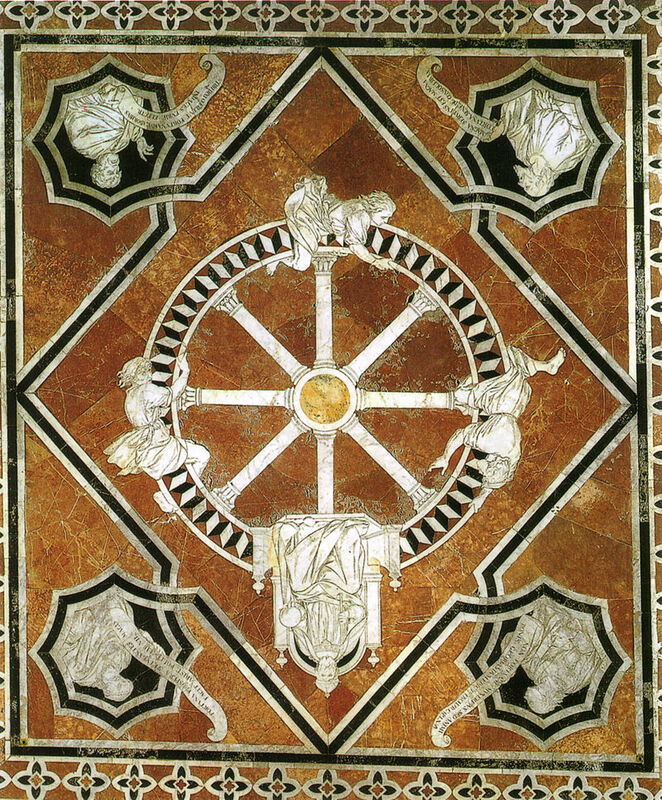 Described by Giorgio Vasari as “the most beautiful … largest and most magnificent … that ever was made”, the floor consists of 56 panels in different sizes. Most of the panels have a rectangular shape, but the later ones, to be found in the transept, are hexagons or rhombuses. They represent the sibyls, scenes from the Old Testament, allegories and virtues. The earliest scenes are made by graffito technique, where scratched lines and tiny drilled holes on the white marble are filled with black stucco. This usually simple technique here reaches a surprising degree of perfection. Later the marble intarsia was adopted, employing coloured marble in much the same manner as wood inlaying. The effect of the black, white, green, blue and red marble results in a vigorous contrast of light and dark. 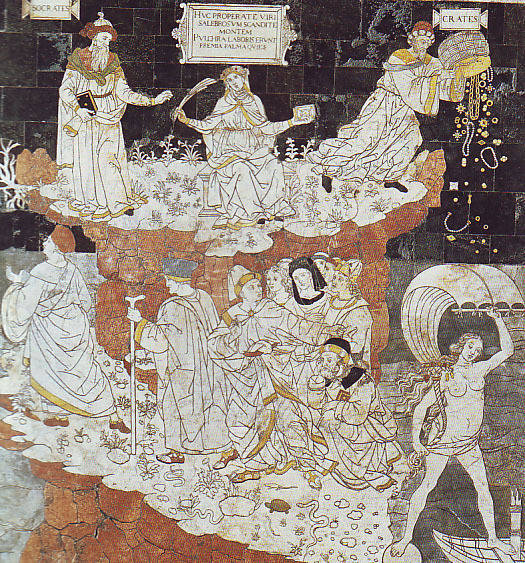 Amongst the various panels one depicts Hermes Trismegistus (1488), the founder of human wisdom. 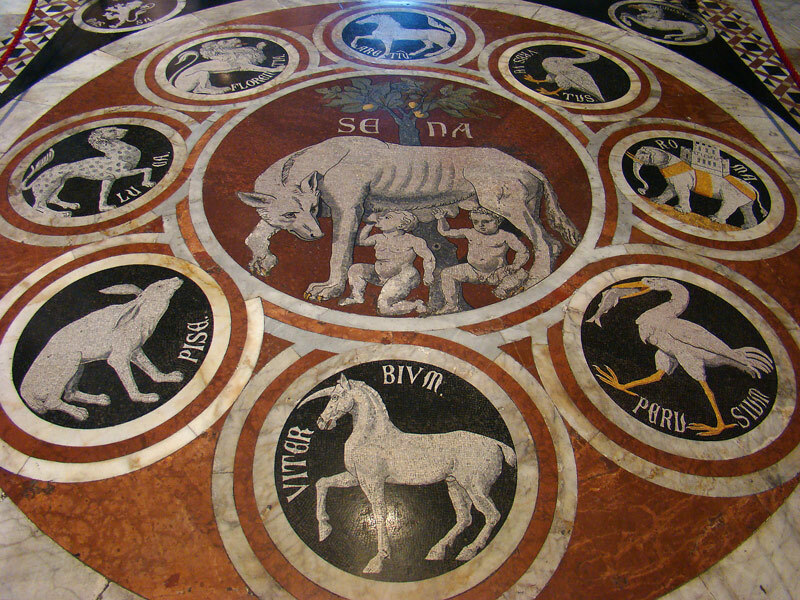 Beyond the Hermes panel in the nave one encounters the She-Wolf nursing the twin brothers, within a circle connected to other 8 smaller ones representing the emblems of cities in Central Italy. Another panel in the nave was designed by Pinturicchio in 1504. It represents the story of Fortune, or Hill of Virtue. The hexagon beneath the dome (Scenes from the Life of Elijah and Ahab), and other panels near the altar (Moses Striking Water from the Rock; Moses on Mount Sinai, and The Sacrifice of Isaac) present works by mannerist painter Domenico Beccafumi, the most renowned Sienese artist of his time, who would perfect the technique of marble intarsia to the point of attaining chiaroscuro effects. Portrayed in the aisles are the 10 Sibyls (1482-83), five for each aisle, named after their geographic location: the Persian, Hellespontine (by Neroccio di Bartolomeo de’ Landi), Erythraean (by Antonio Federighi), Phrygian, Samian (by Matteo di Giovanni), and Delphic Sibyls for the Eastern and Greek world; the Libyan Sibyl for Africa (by Guidoccio Cozzarelli); and then those of the West (with reference to Italy), the Cumaean or Cimmerian Sibyl, the Cumaean Sibyl (of Virgil) and the Tiburtine Sibyl. Undoubtedly a magnificent masterpiece the unveiling of this floor is certainly not to be missed. Questa voce è stata pubblicata in Culture in Tuscany, Events in Siena, Siena, Tuscan churches and cathedrals, Tuscany e contrassegnata con Domenico Beccafumi, Hermes Trismegistus, Pinturicchio, Siena Duomo. Contrassegna il permalink.